The Graco SnugRide Click Connect 40 is the highest ranking Graco product we tested but is still only average regarding overall score. It uses Graco's newer "Click Connect" technology to connect the seat to the base, which works with Click Connect compatible strollers. This seat has one of the best overall scores in our crash test result analysis, delivering a significantly higher margin of protection and exceeding Federal safety standards by a wide margin. Unfortunately, the upgrades and improved design from cheaper Graco options, including a nice non-rethread height adjustment, aren't enough to give this seat the points it needs to break into the top half of products. If you simply must have a Graco seat, then this is your best bet, but we think there are better options available from other manufacturers that have similar price points. The Graco company was founded in 1942 by Russel Gray and Robert Cone. In the beginning, it was a metal fabrication company that primarily made car parts. Eleven years after starting the business Gray left the company and Cone hired an engineer, David Saint, to help design a new kind of product. David created the first baby swing after finding inspiration from a co-worker who used an outdoor glider to soothe and calm his baby. Not surprisingly, the swing was a hit with new parents and sold millions helping catapult the Graco name into one of the world's leading baby product brands. This graph below shows comparisons of the overall scores for all the infant car seats we tested in this review, with the Graco SnugRide Click Connect 40 is shown in blue. The following sections provide details on how this Graco seat performed during testing. All the seats for sale in the US have met the Federal guidelines for safety outlined in FMVSS 213, so they all provide the basic minimum level of safety as required by the National Highway Traffic Safety Administration (NHTSA). The seats in this review all underwent a sled crash test designed to NHTSA standards so we could compare their scores apples to apples. The test used a 12-month-old CRABI test dummy with sensors in the chest and head to determine the amount of G-forces exerted on the body in a head-on collision. The Graco 40 had exceptional results from crash testing, far exceeding Federal safety requirements, and the best overall combined results in this review. The graph here includes the test results for head and chest. The Graco 40 has the best test results for the chest region (g) of the seats tested. It also had the second best results for the head region (HIC). Based on the crash test results, it is reasonable to assume that this seat offers a higher margin of protection than nearly all the options we tested and exceeds the Federal minimum guidelines by a substantial margin. Only the Chicco Keyfit 30 had better numbers in the head force sensor results, and even in that case, the Graco 40 nearly tied with a Head Injury Criteria (HIC) score of 334 to the Chicco's 330 (the Federal safety guideline requires a HIC below 1000, so these scores are impressively below that requirement). The Graco 40 has a footrest for baby 's feet. This is not a structural element and does not serve as a anti-rebound bar like some competing seats such as the Peg Perego offer. However, the Graco does offer a high-back base which may offer some anti-rebound protection. The foot pad on the Graco 40 is not an anti-rebound bar, and parents should not assume that it will work in any way like the anti-rebound bars found on some of the competition. This Graco earned a 6 of 10 for ease of install using the LATCH system. The high in this metric is 10 earned by the Chicco Fit2. This seat has push button anchors that click-in to the LATCH anchors. In our opinion, this type of connector is easier to use than the simpler clip type connectors. These connectors are pushed onto the U-shaped LATCH attachment point on the vehicle until there is an audible click. Pulling back on the latch will ensure it is secured properly. To release you push the red button on the end of the connector. The connectors are easier to tighten than about half of the competition, but you might still need to put a knee into the base to get it snug. They are harder to loosen than we'd like and harder than most because it 's hard to get your hand in the right spot. In general, the seat is relatively easy to connect and secure, plus it feels super stable when properly tightened. The Graco 40 has an adjustable recline feature that helps with finding the right angle for proper installation. It has a unique adjustment that slides up and down to change the recline and has an indicator that tells parents when they have the right angle. We preferred seats that offered some kind of recline adjustment that potentially means parents won't need a rolled towel to obtain the right angle. The Graco Click 40 earned its highest installation score for ease of installation using the vehicle belt. This seat earned a 7 of 10 which is above average and shared by two other options. The highest a 9 shared by the Phil and Teds Alpha and the Peg Perego Primo Viaggio 4-35. The Click 40 has a nice belt lock-off located in the middle of the foot portion of the base. This lock-off is easier to operate and avoid folding the belt when threading it than some of the others in the competition. It does not offer a color coded belt path, but it is easy to thread the belt and utilize the lock-off, which helps get the seat tighter and makes it feel more secure than products without the lock off. We liked this lock and thought it was one of the better options we tested. This seat feels more secure when installed with a lap only belt. However, the disparity of the security between the lap style and the shoulder/lap combo isn't as great as some of the competition. Installing the Click 40 without the base earned a 6 of 10, while the Peg Perego Primo Viaggio 4-35 scored the high of 10. You might go a lifetime and never install a car seat without the base, but if you frequent taxis or travel a lot this might be a make or break metric for you. This seat has the American belt path system which we don't like as much as the European version that utilizes the shoulder belt around the back of the seat and feels more secure. It also lacks a color coded belt path, but given the simplicity of the American belt path it isn't as big of a deal. We found threading the belt to be a somewhat annoying process for this seat and it scored poorly for ease of threading. It is a little bit harder to get the belt truly tight compared to some of the competition, but it didn't require the use of a towel so we think that is a bonus. If you don't want to carry the base around, you probably don't want to bring a towel either. The Graco 40 failed to bring home the bacon or anything else when it comes to ease of use earning a score of 3 for this metric. In out tests, ease-of-use is where this otherwise compelling seat fell well short of our expectations. No seat scored lower for ease of use. The high score is an 8 for the Doona and two other options. The buckle on the Graco 40 is difficult to use. Using the buckle potentially requires two hands because the release button is so stiff. The buckle could get stiffer over time as baby spit up and grime accumulate along the edges. The upside is you can insert the straps one at a time, so you don't have to marry the two side to use the buckle like some of the others we tested, which is nice when you have a wiggly baby. The chest clip is not user friendly compared to competing approaches and the smaller parts can hurt your fingers to operate. The two sides are relatively stiff and take a little more cajoling to open than they should. On the seat we purchased we noticed that if you are squeezing the right side of the clip too hard it can stop the latch from disengaging and you can't get it apart. This Graco seat harness is much harder to tighten than other Graco seats we've tested in the past, which is disappointing on this more premium priced model. The strap to tighten is located at the foot of the carrier portion of the seat and high a high resistance to being pulled. It can require what we feel is an excessive amount of strength to get it moving. It is also the most difficult to use when the harness is in the lowest height position, which means you will be struggling with it the most when your baby in tiny. We fear that being unable to tighten the harness could lead to improperly fitted straps which are a hazard for baby and could result in potential injury. Releasing the harness isn't as bad as tightening and utilizes a button on the foot of the seat. The button for this harness is on top of the padding and easy to push. The harness shoulder height adjustment is a non-rethread design operated from the back by squeezing the two sides of the slider and moving it up and down. The upside is you can do this with baby in the seat and you do not have to mess with a splitter plate or rethreading straps through small slots. The downside is squeezing the small buttons at the same time is harder than you think it will be and harder than the non-threading seats that operate from the front like the UPPAbaby Mesa. It has five shoulder strap heights and two crotch strap positions. Installing the carrier onto the base gave us some trouble in our tests. You really have to give the carrier a significant push to ensure it attaches to the base properly. We had repeated difficulties fully attaching the seat and often thought it was connected when it wasn't. It is hard for us to say exactly what the problem is with the connection, but more than one tester had difficulty getting the carrier to connect to the base completely which indicates an issue in our book. Releasing the carrier is similar to many of the other seats and requires parents to pull up/squeeze the handle on the back of the carrier while lifting off of the base. To operate the carry handle, you press the buttons on each side near the pivot joint simultaneously to activate. The handle has four positions and can be left in any position for car travel. The handle itself is easy to operate, but the handle and the canopy together are kind of a mess and definitely a design mistake in our opinion. When the canopy is fully open we had difficulty getting our hand around the handle without colliding with the canopy. Occasionally, the canopy would fall partially closed or we had to force it under the handle if the handle was already up. There is a similar problem if the handle is down over the head of the carrier, as the canopy will get stuck under it making it hard to open. Graco could help parents by making the handle a little taller or the canopy a little shorter. However, in the meantime, get ready to be annoyed. This seat has LATCH anchor storage on the base by way of a small compartment near the foot. This compartment works well and will keep the straps out of the way when connecting the carrier portion of the seat to the base. Given the already mentioned difficulties we had with thinking the seat is connected, we are grateful that the LATCH anchors are not a problem as well. The Graco 40 earned a score of 5 of 10 for comfort and quality. We found most competing seats offer nicer comfort and quality. The highest score is an 8, earned by Chicco Fit2, Phil and Teds Alpha, Cybex Cloud Q, and the Peg Perego Primo Viaggio 4-35. This seat has a soft head and body cushion that is superior to other Graco seats. It also has a padded insert to help position smaller babies and keep them cozy. It isn't the best padding when compared to the competition, but it is above average. The fabric on the seat itself is a little stiff, but not as bad as some of the other seats that actually feel somewhat abrasive. The seat cushion fabric is softer and removable for washing. Notice that with the handle and canopy in the upright position on the Graco Click Connect 40 that it is impossible to grip the handle without the canopy getting in the way. All the Graco handles rubbed on the canopies and made it difficult to use both at the same time. The shell quality and durability fared about average compared to the competition and neither impressed or disappointed us. It is made of a relatively hard plastic that has smooth edges and didn't flex under pressure. The fabric and padding fit nicely to the shell. The small connection point at the top of the window on the Graco 40 allows the sides to gap and sun to peek in. The Graco canopy is slightly larger than the Graco 35 and sports a peek-a-boo window, but it is sort of frumpy looking on the frame, and it has difficulty staying up when the handle is in use. The window is made of mesh and has a hook and loop closure at the top. When the cover is closed the sides hang down and allow sun to creep in, a magnetic closure that ran the entire length of the cover would have been nicer, quieter, and more effective. The Graco Click 40 weighs in at 10.25 lbs, which it a bit heavier than average of 9.4 lbs. The heaviest seat is the Doona, but this option comes with stroller components and wheels. While weight shouldn't be your primary metric for decision making, it certainly can help you decide between two or three finalists. 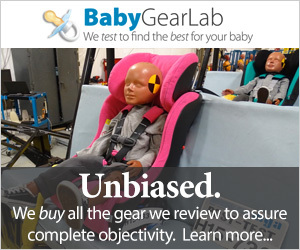 This is the best Graco car seat we tested, and we previously included four Graco seats in testing, but it is not the best car seat by a wide margin. We suggest parents expand their brand knowledge by purchasing a seat with better scores and improved features. However, if you already own a Graco compatible stroller and need a seat that will work with your stroller to avoid buying a second one, then we feel this is the best Graco in the review. Just ensure that your stroller is compatible with the newer "Click" connect as opposed to the "Classic" connect. There are several competing products in this review that earned higher overall scores than the Graco Click 40 and also had lower list prices. This makes the Click 40 not a great value in our minds. While it arguably has some of the best results for crash tests, earning it an impressive 9 of 10 score on this metric, we don't think this makes it a better buy than the seats that score slightly lower for crash test but significantly higher overall. While we preferred the Graco Click Connect 40 over other Graco options we've reviewed, we also feel they aren't doing much in the way of design or functional features and quality compared to the competition. This seat is a middle of the road choice with a slightly higher than average list price. For a cheaper price parents can enjoy a much nicer option with better overall scores and improved functionality such as the Chicco Keyfit 30. The canopy alone showed lack of thoughtful design in our opinion, and given that it has been a problem for years we can't help but wonder when it will be fixed. Despite its nice crash test results, it feels like Graco may be sitting on its laurels and getting by on its name alone. We'd love to see Graco redesign this seat, retaining the excellent crash test results, but improving the other details, we felt fall short of the competition. Graco is a good company, with some great products, and we think consumers deserve to see a top scoring seat from Graco. Graco offers several other car seats for infants. We also tested the Graco SnugRide Click Connect 35. The Click 40 earned the highest score of the Graco car seats we tested and sports features that are both functional and useful like the non-rethread height adjustment and the sliding recline. An additional product we like is the Cozy Greens Back Seat Mirror from Cozy Greens because it is great for parents to keep an eye on baby from the front seat. This mirror attaches to a flat base that fits against the front of the headrest and has two adjustable straps that tighten around it. The mirror has a convex shape is shatterproof. Its ability to move and adjust is convenient because it provides a larger field of view. Once positioned correctly, there is a tightening device on the pivot point, so the mirror won't be accidentally bumped out of place. This mirror requires an adjustable headrest in order to work, so may not be compatible with all cars.